One of the first questions that someone contemplating a reverse mortgage inevitably asks is, “How much can I get?” Fortunately, you no longer need to speak to a lender in order to obtain an accurate answer. There are several reverse mortgage calculators available for free on the web, which will give you an estimate of how much you can borrow. 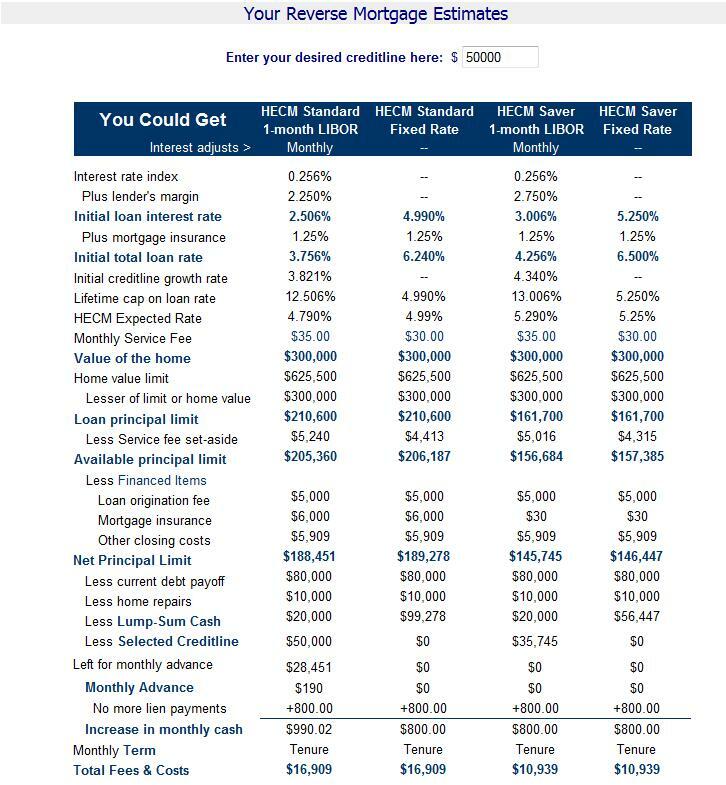 The best one that I’ve come across is from the NRMLA; if you’re planning on obtaining a Home Equity Conversion Mortgage (HECM) as 95% of borrowers do, this is the only calculator you need to reference. (If you’re interested in a single-purpose or proprietary reverse mortgage, you will probably have to speak to the state agency or lender, respectively, in order to obtain an accurate estimate, since terms may vary). I found that the NRMLA calculator was the most comprehensive and the most transparent, which is why I’m recommending it here. We also offer a balance remaining reverse mortgage calculator. 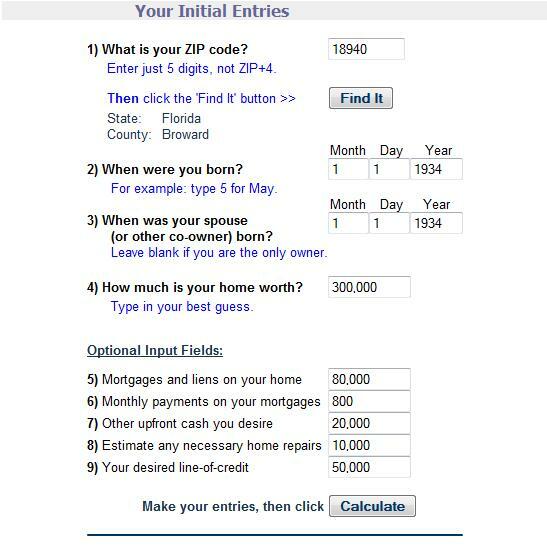 On the reverse mortgage calculator input page, start by entering your zip code (because of regional differences in taxes/fees), and the Date of Birth for you and your spouse. With more than one borrower, the lender will use the younger borrower’s age as a basis for calculating the reverse mortgage, which will yield a smaller loan amount. (You can read an earlier post I wrote to understand your options if there are two primary borrowers). Next, you need to estimate how much your home is worth; try to be precise, since this is the biggest variable in calculating your loan amount. (Before obtaining an actual loan, your home will be formally appraised). The final set of inputs are optional, and may not apply to your situation. If you have existing mortgage debt/liens, these will need to be paid off upon obtaining the reverse mortgage and subtracted from the principal that you would otherwise be eligible for. The same is true for necessary home repairs; one of the conditions of having a reverse mortgage is that the home must be continuously maintained. Failure to do so could result in your being denied a reverse mortgage initially or a cancellation of the reverse mortgage (and foreclosure of your property) down the road. The field entitled “Monthly payments on your mortgages” doesn’t actually bear on the reverse mortgage; it is merely included to show you the net change in your monthly cash flow if you elect to receive your reverse mortgage proceeds in the form of a (tenured) monthly payment. “Other upfront cash you desire” will be subtracted from any line of credit. On the flipside, “Your desired line-of-credit” will be subtracted from your available cash if you elect to receive a lump-sum payout. Now, that you have filled out all of the input fields, click the Calculate button to view the results. Voila! You can see from the Output page (reproduced above) that you actually four separate options when obtaining a reverse mortgage (and several sub-options, which I will explain below). First you must decide between an HECM Standard and HECM Saver. The main difference between these two loan types is that an HECM Standard offers a higher loan amount, and consequently, an upfront insurance premium. (For more on this distinction, you can read an earlier post on the subject). You can see how this is reflected in the calculations. Next, you must decide between a variable rate (which fluctuates over time) or a fixed rate. The downside of choosing a fixed rate HECM is that you must take all of the cash upfront, and cannot elect to receive a monthly payment or line of credit. Depending on your inputs and certain actuarial assumptions that HUD makes about you as a borrower, “The table below shows the maximum creditline (with no monthly Income), and the maximum monthly income (with no creditline) that may be available after paying off any mortgages and liens against your home,” as well as the maximum lump-sum payment. Notice how these values differ depending on whether you opted for an HECM Standard or HECM Saver. In addition, your (hypothetical) credit line will accrue interest if you allow it to sit idle and don’t draw from it. Based on today’s interest rates (which fluctuate periodically), you can see how much your Line of Credit will expand over time. 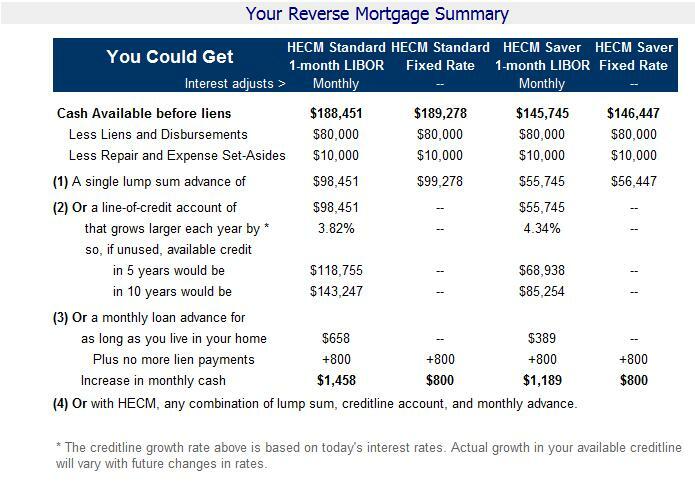 For fun, the Calculator also shows you how much your monthly income will increase if you use the reverse mortgage to pay off an existing mortgage. (The idea is that if your previous $800 mortgage payment disappears, you will spent $800 less every month after you obtain a reverse mortgage, and this $800 can be thought of as a positive change in your monthly cashflow). Technically, you can stop here. If you’re curious, Click on the Estimates button at the bottom of the screen to see how these figures are calculated. You can see first how the loan rate is basically a summation of the interest rate (dictated by FHA for fixed-rate mortgages and by investors for variable-rate mortgages), plus lender’s margin (which must be factored into a variable rate mortgage), and a 1.25% annual FHA insurance premium (which protects you from owing more than your home is worth when your home is sold and the reverse mortgage is repaid). Based on the estimated value of your home (which can’t exceed $625,500 for purposes of calculating the reverse mortgage loan amount) and your age, the Calculator will determine how much you are eligible to borrow. It will subtract the Service Fee Set Aside (SFSA), which is paid upfront as an amalgamation of all of the $35 monthly service fees that the lender collects over the life of the mortgage. It will further subtract origination fees, upfront mortgage premium (only for HECM Standard reverse mortgages), and other closing costs, since these are financed into the mortgage and not paid out of pocket. (You can view Total Fees & Costs at the bottom of the table). After all of these deductions, you can see your Net Principal Limit. This will be further tweaked depending on the optional inputs you entered and the method that you elect to receive your cash (tenure, line of credit, lump-sum payment). Of course, these figures represent estimates only. Different lenders may offer slightly different promotions/terms. If you decide that you want to move forward with a reverse mortgage, the next step is to start speaking to specific lenders/brokers.